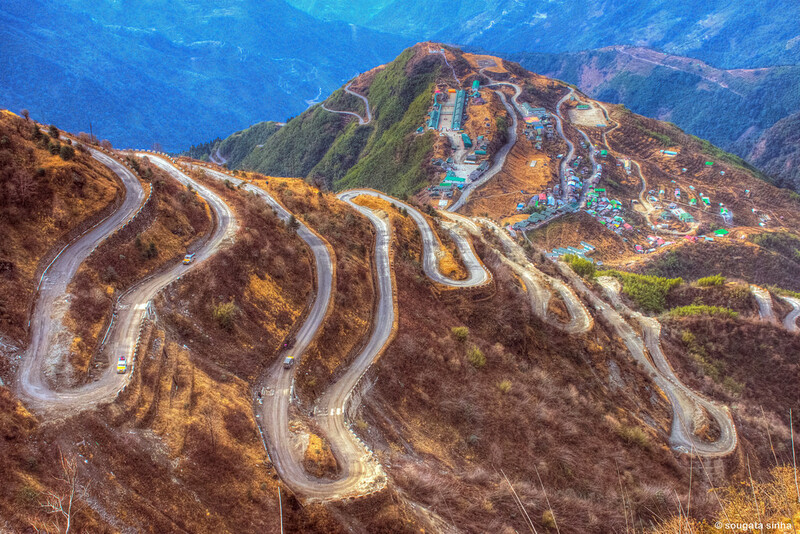 The Silk Route of North Sikkim is indeed a must-visit for every road-trip junkie. You will be surprised to know that the entire silk route covers Middle Eastern Kingdoms, India, China, Egypt, Persia and extends up to Europe. The entry point from our country is through North Eastern Sikkim. The entire route is the perfect blend of mesmerising beauty and rugged terrain. The beautiful views of the Kanchenjunga from dizzy heights will definitely make your trip memorable. Just don’t forget to fill the fuel tank of your car, pack the boot and unlimited supplies as there are many places to explore in this trade route. If you are willing to stay away from the hectic city life, a visit to the Nathula Pass in the Old Silk Route will fulfil this desire of yours. It attracts numerous tourists all over the year as the temperature sometimes drops to -25oC during the winter season which enhances the beauty of the place even further. You can obtain a pass by applying to the Tourism and Civil Aviation Department. This valley has become a quite favourite place for those exploring the Sikkim silk route. It is adjacent to the Nathang Valley and so the landscape is more or less similar. Soak the beauty of a white valley covered with snow if you are planning the trip during the winter season and get to see a colourful valley filled with rhododendrons during the spring. Visit Zuluk once and you will realise why it is treated as one of the most peaceful places in India. It is situated at an altitude of 10,000 feet in East Sikkim which enhance the beauty of this unexplored place. If you are willing to unravel the true magic of Zuluk, don’t forget to include the Thambi View Point, Lungthung, Adi Baba Mandir and the Kalpokhari Lake in your trip itinerary. A unique feature of the Nathang Valley is that tourists can witness the place in different colours according to the time of the year they are visiting. The valley looks golden as the grasses surrounding it dries up, it looks white during winter as the place gets entirely buried under snow and becomes quite colourful during the rainy season with numerous blooming flowers. These being said, it’s time you include the places stated above in your trip itinerary and explore the true essence of the Sikkim Silk Route.